Book Review: Sales Management. Simplified. In 1996 football coach Bill Parcells famously resigned as the coach of the New England Patriots with the parting statement, “If they want you to cook the dinner, at least they ought to let you shop for some of the groceries.” I often think of that quote when I consider the role a sales manager plays in an organization. If I had to rate the toughest jobs in the business world, I’d have to rate sales manager at (or at least very near) the top. While roles like CEO, head of operations, human resources, etc. are certainly filled with more than their fair share of stress, there is probably no position that has more responsibility for success, often with less input and control, than the sales manager. The sales manager is in the unique position of serving as a critical leverage point in distributing a company’s message and in ensuring the implementation of the go-to-market strategy, with (all too often) little input into the strategy and tactical plans that are developed. Add on top of that, they’re responsible for “managing” some of the least manageable people in an organization, namely salespeople. Having run sales teams for years, and for the last 10+ years working with sales teams from a variety of organizations, I’ve seen firsthand some of the biggest mistakes that can be made with sales managers. Here are three that tend to plague organizations most frequently. Somewhere along the line, the sales manager’s role went from being focused on implementing best practices, growing the sales team and determining how to best allocate sales resources for growth, to one that is focused on compliance and spreadsheets. When they’re talking to a prospect about buying something. When they’re directly preparing to talk to a prospect about buying something. When they’re working with or coaching a sales rep. When they’re doing non-bureaucratic work that makes a sales rep’s job easier (this means when they’re dealing with internal politics and BS, they’re not actually working). The fundamental purpose of a sales manager is to ensure that the salespeople in the company grow and succeed. Unfortunately, too many companies look to the sales manager as the one to close “the big deals.” They justify the “cost” of a sales manager by the revenue they expect from the effort. When sales managers have responsibilities to close sales, then the bottom line is that they are competing with their salespeople. Sales managers should be judged by the results they get from their team, not by the business they are able to close on their own. Don’t misunderstand, I’m not saying that a sales manager shouldn’t be involved in supporting a salesperson in working with bigger (or other) opportunities. While there are literally thousands of books that focus on selling skills, strategies and approaches, there are very few that focus on what it takes to be an effective sales manager. Those that do tend to focus on technical components of management rather than on how to be an effective sales manager. All of this is why when I heard that Mike Weinberg, author of New Sales. Simplified. was writing on new book specifically on sales management I was looking forward to its release. Mike was kind enough to provide a copy for my review and I’m happy to share my thoughts with you. Here’s my review in four words: Mike nails sales management. Frankly I wish I had this book when I first started leading sales teams. It would have saved me many battle scars. Weinberg has a direct (one might say blunt) style of writing. Where most sales management treatises are boring and technical, Sales Management. Simplified. is entertaining and completely real. What I enjoyed most from reading the book (other than the myriad of stories that I could identify with) was that every page was written from someone who had clearly lived the life and dealt with these issues firsthand. This made the advice shared simple, effective and pretty easy to apply. A successful sales manager must be giving of their time. They realize they are only successful when the people who work for them are successful. Trying to do both is simply a recipe for failure. This is one of the toughest challenges I regularly see in small and mid-sized organizations. They don’t deal with mediocre or underperforming salespeople well. Weinberg shares a story that is all too familiar. I’ve worked with many an organization where we’ve acknowledged that a salesperson on staff is just not (or no longer) capable of significant success and nothing happens. As he shares, everyone else in the organization is dependent on your sales team’s success. If one person is not producing it not only harms the entire organization, it sews the seeds of complacency into other sales performers. My favorite part of the chapter is where Weinberg points out that 100% commission is not a pass to overlook poor performance. The opportunity cost associated with the sales function is simply too high. No surprise coming from someone who is called The New Sales Coach. Weinberg highlights the importance of coaching and mentoring salespeople. Please note that both coaching and mentoring are different than training. Training is important, but yields incremental results. Coaching leads to transformation and game-changing results. It’s a great, entertaining and instructive read. However, there were two areas that bothered me a bit, one of which I have to comment is a miss in today’s sales world. 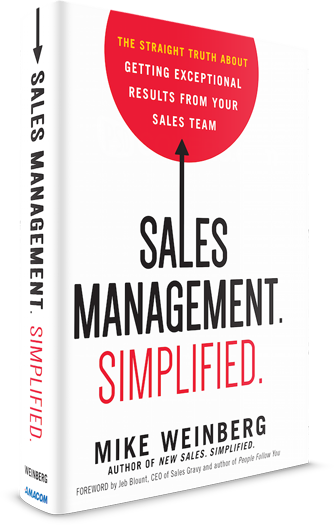 Weinberg does a great job highlighting what a sales manager needs to do as an individual and as a leader in the sales side. However, little to no mention of the role of marketing was mentioned. Alignment between the sales and marketing efforts of an organization are crucial, and a sales manager plays a pivotal role in driving and maintaining such alignment. I would have liked to have gotten Weinberg’s take on how sales managers should interact with, support and be supported by the role of marketing. Mike is very fond of war-like terms to describe situations. For example, one chapter is titled, “The Sales Manager Must Ensure That the Team is Armed for Battle.” Now I know Mike enough that I know what he means, and in the past I’ve used metaphors like that as well. So, all things considered, this may be a small thing to pick on. However, I firmly believe that words mean things, and that too many salespeople enter the market from an adversarial perspective. Today the sales process is more collaborative than ever before (both within the selling organization and with the buying organization). I’ve found that using metaphors that align to today’s approaches are more effective to get salespeople to behave collaboratively. I’ve also found that many potentially great salespeople are turned off to the profession because it’s positioned in such a manner. All said, Sales Management. Simplified. is a book that belongs on any executive’s shelf. You’ll gain quick insights into how to drive better performance throughout your organization.